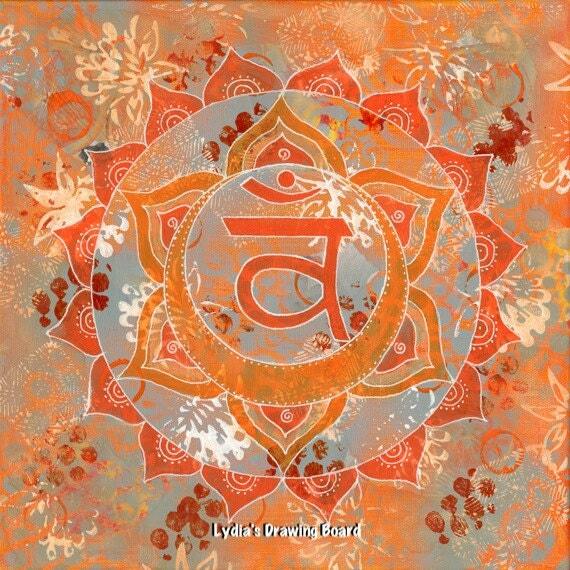 Lovely square notecard featuring a print of an original mixed media interpretation of the second chakra. The size is 5 1/4" x 5 1/4", printed by the artist at her home studio on quality white matte notecard using an Epson Stylus Pro 3880 and archival inks. Comes with matching envelope. The watermark will not appear on the card. Signed and suitable for framing (includes a small white border). According to Wikipedia, "Svadhishthana (Sanskrit: स्वाधिष्ठान, IAST: Svādhiṣṭhāna, English: "one's own base") or sacral chakra is symbolized by a white lotus within which is a crescent moon, with six vermilion, or orange petals. The seed mantra is Vam, and the presiding deity is Brahma, with the Shakti being Rakini (or Chakini). The animal associated is the crocodile of Varuna.